As an artist, you must be original. That is, you do not want to copy something that others have created, you want to make something that is your own, that is unique. But can it really be unique? It is impossible to create something totally new, because you must use things that others already have seen and used before, but combine them in another way. Others may have already used the same colors, the same shapes, the same material and so on. What makes your creation unique is that you combine all these possibilities in a totally new way. In a way that is unique to your own creation. Among art people this is often discussed. Within the polymer clay community, it is common with tutorials, ie online courses where artists teach different techniques. In this way we can learn and be inspired from each other, but an ongoing discussion is about the difference between copying and inspiration? And if you choose to teach a certain technique, can you say that you have exclusive rights to that technology and that no-one is allowed to use it? I follow these discussions with interest, but my feeling is that there is no major problem. I myself have made tutorials on how to create a horse, for example, in Polymer Clay Adventure 2018, and if someone creates a horse according to my instructions, I’m only happy, although I hope to give inspiration to develop their own version of “my” concept and create a horse (or something else) in their totally own way. This is a December calendar with brief views in alphabetical order throughout advent, over Christmas and until New Year’s Eve. Every day is a new word. I look forward to your class! I have always loved that design but I never knew what it was called! You sent me down a rabbit hole and I made a new pinterest page! 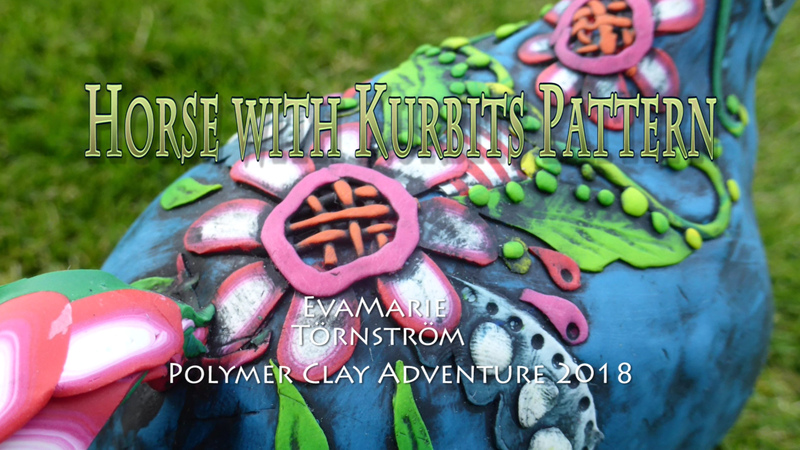 I have been inspired to make a 3d kurbits (not printer in clay of course) like a totem pole !